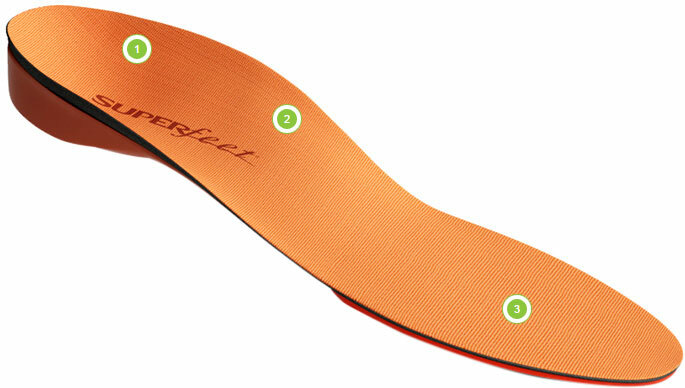 The Superfeet Orange insole provides high-impact performance and comfort. Engineered for high-impact activities and featuring a shock-absorbing foam forefoot for people who punish their feet. High-profile insole that offers a deep and narrow heel cup for maximum support. All types of medium and high-volume footwear with removable insoles like athletic shoes and boots. Based on the principles of podiatric medicine, Superfeet's shape, design and manufacture have set the standard for support. Superfeet insoles help adapt the flat, 2-dimensional midsoles of your footwear to your 3-dimensional foot. The distinct Superfeet shape helps to stabilise the foot, while the deep, structured heel cup and full-length foam provide support and comfort. Deep Heel Cup - Features a deep, narrow heel cup that helps support the foot during high-impact activities and long distances. Biomechanical Shape - The slim, contoured shape helps stabilise and support the foot, which can help reduce stress on feet, ankles and knees. Superfeet Orange Insoles is rated 4.1 out of 5 by 22. Rated 5 out of 5 by KyliesBloke from Really Comfortable I suffer from plantar fasciitis and I absolutely swear by Superfeet products. These particular ones I have in some approach shoes and they feel like custom made shoes, so much more comfortable and pain free arches! Rated 3 out of 5 by spinalTap from Good but professionals advise there are others I have loads of pairs of these now, and they were my go to insole, but an NHS physio advised me of some slightly more suitable ones of another brand which would be better for me personally as they come with a kit of foam parts to subtly adjust the support under the heel. These are still good tho - but ask a physio first! Rated 4 out of 5 by Tychom from So far so good Fit Superfeet insoles across a few pairs of shoes to help out with some plantar fasciitis. Can't say which is best for me yet, black, orange, but between the two the results have been exceptional. No idea about longevity but I'm happy so far with this product. Rated 5 out of 5 by ZH86 from Very good insole for over-pronunciation runner Running 1400 miles/year, this is my 6th pair of those insoles. I first needed to adabt to them but now I can't see myself running without them. They bring a lot of comfort and support. As menttioned in oter reviews, don't expect them to last for life. My experience is that I can do 700 to 1000 miles max with each pair. It's also true that they are pricey though worth it. I am suffering from numb toes (big toe mainly) and I'm wondering which superfeet colour would you recommend? I have a very high arch foot so would need a high support. Also I would need quite a thin insole too . You'd find the Superfeet Carbon or DMP insoles might be the best of the range to go for as they offer a tailored fit to your foot. Alternatively, the Sidas Run+ footbeds would give the best level of support as they're supplied flat and can be custom molded to your foot shape at a local store with qualified sidas footbed molders. Superfeet Orange size F seem to be more narrow at the plastic heelcup than the Green insole size F.
If I want the same width as Superfeet green size F -should I go for size G on the orange sole? I can confirm that the width of the heal should be the same on the green and the orange as the difference will be the depth of the heel cup and that the orange has padding under the for foot. I hope this helps. Are the high insoles suitable for cycling shoes? I suffer from numbness and pins &amp; needles in 1 foot, would these help? These are suitable for some cycling shoes. We would advise in this case Superfeet yellow as a recommendation for the level of support you are looking for.